In this tutorial I will teach you how take input from user and how to use conditional statements. First of all we will declare an integer and an alphabet. In this program we will only use these variables to take input and we will simply print these variables just to check whether the program is taking correct input or not. Now writing the print statements first and then we write the scanf function which is used to take the input from the user. In scanf function we first write the type of variable in which we are taking input by using the format specifier i.e incase of integer is %d and incases of character is %c and then we used the & symbol with our variable name this is to give compiler the address of the variable in memory , you will understand it later just write this & symbol as it is for now. In the end we just pause the screen using getch function and return 0 ( write it as it is for now ) and our program is complete. 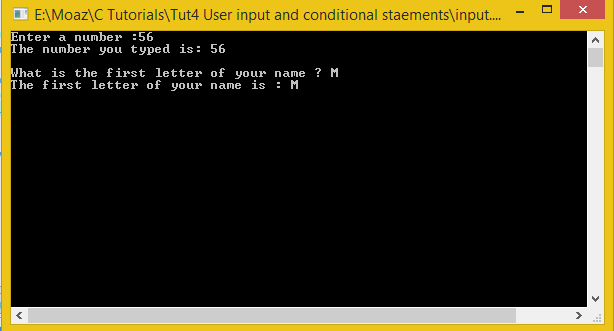 The if , else and else if statements in c are called conditional statements. 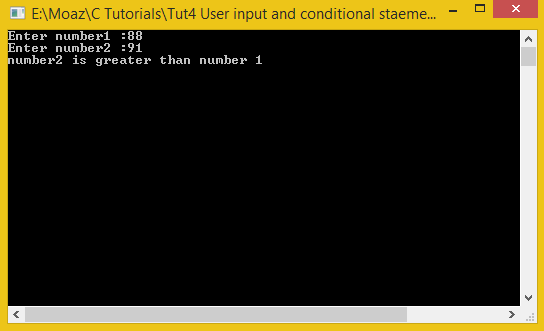 Now we will write a program to compare two numbers using conditional statements. There are three possibilities that a number is either greater, smaller or equal so we will write the conditional statements for all these possibilities. When number is greater, when it is smaller and if both possibilities are false then we go to else that both numbers will be equal then. After that we pause the screen and return.